William H. Cleveland, M.D. - Southwest Atlanta Nephrology, P.C. Home >> Providers >> William H. Cleveland, M.D. William H. Cleveland is a physician specializing in nephrology. He currently serves as a Clinical Nephrologist on the medical staff of seven Atlanta hospitals and Medical Director for two Atlanta-area dialysis centers. 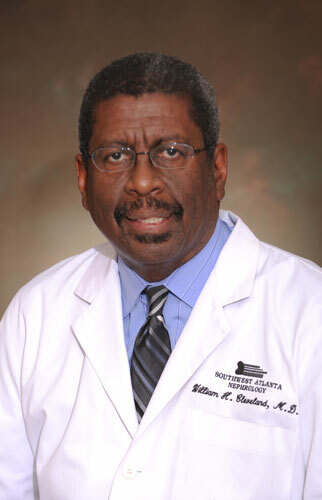 Dr. Cleveland is President of Southwest Atlanta Nephrology, PC and Nephronet, LLC and is a past president of the Crawford Long Hospital Medical Staff. Previously, Dr. Cleveland served on the Georgia Health Sciences University Board as well as on the Board of Regents of the University System of Georgia. In 1999, he was honored by the International Olympic Commission with a Distinguished Service Award. Dr. Cleveland earned his Bachelor of Science degree from Morehouse College and doctor of medicine degree from the University of Pittsburgh School of Medicine. He enjoys music, reading, and experimenting with new techno gadgets. He resides in Atlanta with his family.